Halloween is just plain fun. We get to play dress up no matter what age we are. We go to parties and there is candy--lots of candy. These easy to whip up candy bar wrappers dress up a full sized Crunch bar or Hershey bar for a fun party favor or any special trick or treater! 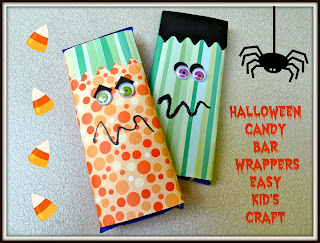 Make a Frankenbar and/or pumpkinbar sleeve and just slide in your candy bar. Easy and inexpensive, so gather the kids and have a family craft night! 1. To make the Franken-bar wrapper cut a piece of green striped scrapbook paper 5 ½” x 5 ½”. Wrap around the candy bar pressing lightly on the edges. This will slightly mark where the front of the candy bar will be. 3. Punch out two circles from the paper punch. Attach the two circles with the glue stick on the front of the sleeve. (See photo for placement) Use some tacky glue to glue on Halloween wiggle eyes leaving a little bit of the black paper above to represent the eyebrows. Draw a wiggly line under the eyes with the dimensional fabric paint for a mouth and let dry completely. 4. When all the glue and paint is dry, attach the edges together with the glue stick and slide in your candy bar. Follow steps 1 and 2 except use the orange circle scrapbook paper for the sleeve and the green striped paper for the bangs. Follow with step 3 but substitute the square paper punch with the black paper to make your pumpkin’s eyes. Attach the wiggle eyes leaving some black paper showing above like you did on the Franken-bar sleeve. Repeat step 4 to finish. Love these. So cute and easy to make. Coming over from Trick and Treat Party. This is so much fun! Excellent Crystal!! These are adorable, I love the silly mouth and googly eyes! I would love it if you'd stop by.